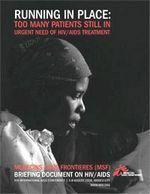 HIV/AIDS treatment and management are essential components of many Médecins Sans Frontières (MSF ) programs worldwide. Currently MSF provides antiretroviral therapy (ART) for over 140,000 patients in 27 countries, with about 10,000 of those patients being children. In conjunction with this year’s International AIDS Conference in Mexico City, this document presents MSF ’s current “state of play” in providing quality care to people living with HIV/AIDS (PLWHA) in resource-limited settings. Despite billions of dollars in funding and widespread global attention, scaling up effective medical care for people with HIV/AIDS continues to pose massive challenges. Progress in ART rollout remains uneven, with major deficits in certain countries, especially among vulnerable groups and in rural areas. Not to be forgotten are conflict-affected areas of the world, where in the context of instability and insecurity the needs for HIV care are equally important but less well understood as elsewhere. Adapted medical and operational strategies must be considered for PLWHA in these zones.